The fiftieth anniversary of Sleeping Beauty is the fortieth of Woodstock. 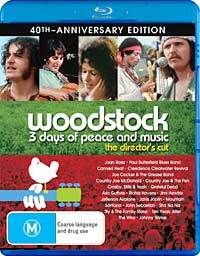 Part of the reason that Woodstock is remembered above the other music festivals of the time would be the superb line-up of talent. But a large part must be due to the movie, which allowed its influence to extend far beyond the 400,000-odd who actually attended. The original theatrical release was 184 minutes. This version is the 224 minutes long 'Director's Cut'. The back of the box says 215 minutes, but that's the timing of the PAL DVD version which runs 4% faster ... and at 4% higher pitch. The restoration of what is part documentary, mostly monumental music video, to the correct pitch alone makes this Blu-ray worth while. You also get a significantly improved picture over the DVD, even though marked limitations remain. That's largely due to the extreme editing employed, with lots of split screen work. Performed in analogue, it must have degraded picture quality. Along with the conditions in which the footage was shot, the most surprising thing is how good it often looks. And how good it often sounds. The movie is supplied on the Blu-ray with a lossless Dolby TrueHD 5.1 channel mix. As a welcome departure from Warner Bros' earlier practice, this disc defaults to the TrueHD audio, rather than the Dolby Digital also provided. If you don't have TrueHD decoding capabilities, the Dolby Digital versions (both the standalone one and the core) are supplied as 5.1 channels with a bitrate of 640kbps, the maximum possible for the format. Some parts -- such as the opening Crosby, Stills & Nash song playing over the scenes of the festival being assembled -- were strong, clean and far beyond what I'd expect from a 1969 live recording. Most of the rest were from serviceable to good. Exceptions were a thinnish job on The Who's two tracks, and the Sha-Na-Na performance, which sounded very crunchy indeed. This track also finished with an unfortunate artificially inserted surround sound flourish. No chapter listing is provided with this version of the disc, and the 'Scene Selector' pop up is not all that clear. You can download a PDF of the track listing from here (right click and choose 'Save Target As ...'). The above was written for the single disc edition, but it's far better to purchase the 'Ultimate Collector's Edition' version. This comes with some 'collectable' reproductions of Woodstock tickets and whatnot. But most importantly, it comes with a second disc carrying 106 minutes of HD featurettes which are actually rather informative, and 144 minutes of songs that didn't make the movie. Some 24 of them, including numbers from Creedance Clearwater Revival, The Who, Jefferson Airplane, Jimi Hendrix and even a 38 minute one from Grateful Dead. The facts section below refers to the Ultimate Collector's Edition.